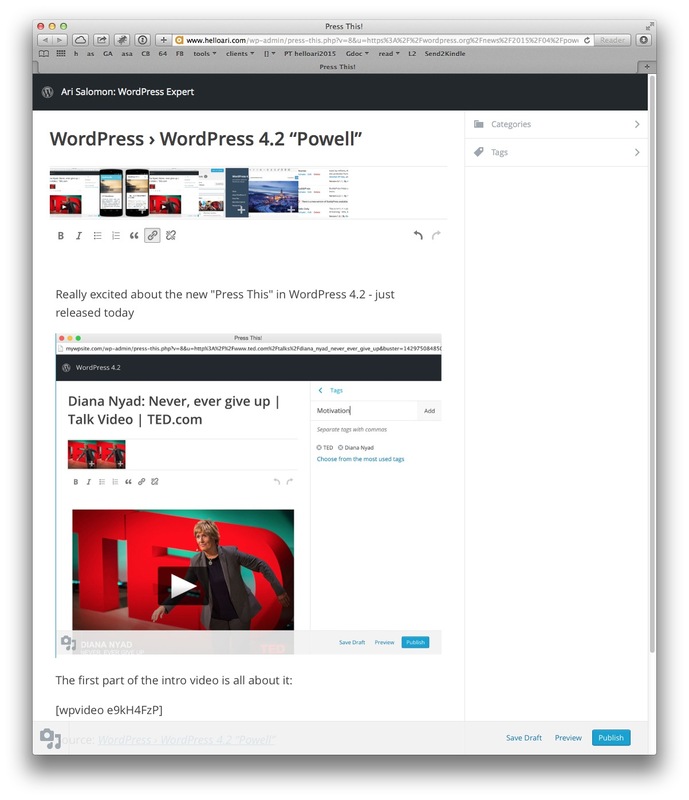 Really excited about the new “Press This” in WordPress 4.2 – just released today. Here’s how it look (and a “meta” screenshot of me making this post). But I found a bug already – dragging an image into the browser uploads to media library but “add to post” button doesn’t actually add it to the post. This was always an issue with the older PressThis – it opened up the ease of adding images to media library from an external web page but would not allow adding images directly to media library/this post. Well there is also the nice new “undo” button…. You can now also save PressThis as an “app” using the “Add to Home Screen” button on an iPhone. then you enter a URL to “scan” for content. It works and is a great shortcut but I found it only grabbed images – not the page title. And of course you can’t preselect text from the source web page to start your post – that’s a great feature of the full PressThis bookmarklet. This entry was posted in Web Design, WordPress. Bookmark the permalink. Both comments and trackbacks are currently closed.